It does go upside down !!!! 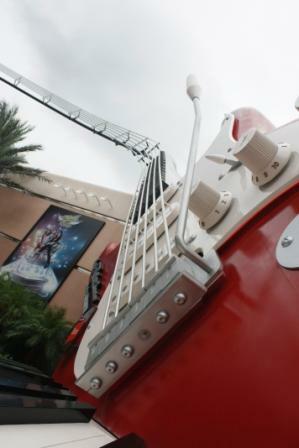 Rock ‘n’ Rollercoaster is located in Hollywood Studios at the far side to the main entrance. The ride itself is located on Sunset Boulevard, next door to the Tower of Terror and the Fantasmic show. The ride is a must when visiting Hollywood Studios and is one of our favourites. 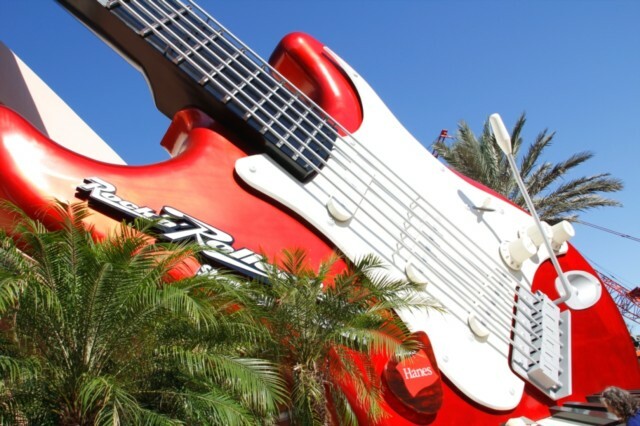 The ride named after rock band Aerosmith is easy to spot from the main boulevard, there is a huge red guitar that is above the main entrance. This area is used by many families as a waiting spot, so can get a little busy in the peak season. Once in past the entrance you have to wind around a fair bit in the queue before you actually reach the recording studio where Aerosmith are recording. One of the main reasons we like this ride is the fact the band actually seem as though they are right behind the screen interacting with you. The band then invite you to a concert where you are asked into the stretch limo waiting outside. From here you are escorted to your limo. The ride itself starts off by firing the limo from 0- 60 in 2. 5 seconds and then goes through various loops, inversions and sharp turns. Most of which is in the dark. The ride feels very smooth and not like some rides that tend to make you feel sick when they invert so often. All the way round the ride you are blasted with some tracks from Aerosmith’s back catalogue, this is a real nice touch and enhances the ride further. 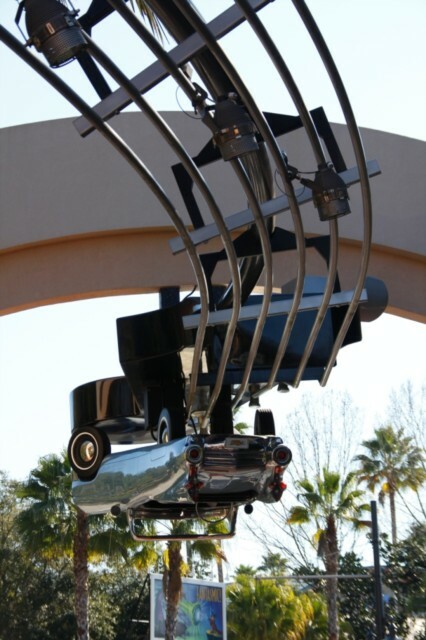 As you go round the loops you can look out for some prominent Hollywood landmarks as you make your way to the concert. When you finally come to a halt at the end, you can actually feel your heart racing and adrenaline pumping round your body. After the ride most people head for the picture order point to see their faces after the first loop, for us the cost of these is always a little too expensive and we normally give it a miss. In the main months it is always best to try and use a fastpass for this ride to ensure that you do not have to wait more than 15 minutes for the ride. We normally get the pass and then come back later in the day at the designated time, this does save the long queue and gives you more flexibility to visit other rides. Overall I would rate the Rock ’n’ Rollercoster one of my top 5 rides in Florida - it is a must when visiting Hollywood Studios. Viewed 3610 times since 5 August 2009.